Leaders from the Caritas Social Action Network (CSAN) met at Palazzola near Rome over the week 24-28 September 2018. The purpose of the week was the formation of leaders within the Network through personal development, developing relationships as a community of leaders and experiencing being part of the global Caritas family and universal Church. Throughout the week lectures were given by Kerry Alys Robinson, who is the founding member of Roundtable, an organisation established in the USA which is dedicated to promoting excellence in the management, finances and human resource development of the Catholic Church. In between the lectures the conference made two visits to Rome. Morning Mass was celebrated in St Peter’s Basilica at St Peter’s Tomb Altar. This was followed by a visit to the soup kitchen of the Community of Sant’Egidio, a truly inspirational experience where volunteers talked of how they support the homeless and then a meeting with Caritas Internationalis and the Dicastery for promoting Integral Human Development. 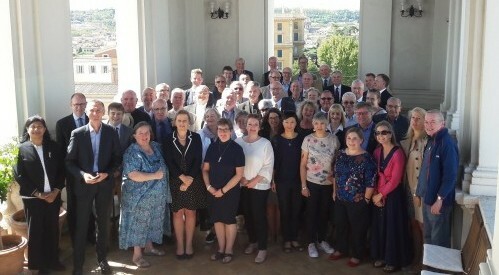 On the second visit to Rome the conference had lunch at the British Embassy to the Holy See with Ambassador Sally Axworthy. This was followed by a Mass with the Bishops of England and Wales, who were visiting Rome for their quinquennial ‘Ad Limina’, at the Basilica di San Paolo fuori le Mura, around the Tomb of St Paul. Carol Hill, Director, representing Catholic Care, said it a been a “wonderful and truly inspirational week”.